In this thoroughly updated second edition, Judith Walzer Leavitt, a leading authority on the history of women's health issues, has collected thirty-five articles representing important scholarship in this once-neglected field. Timely and fascinating, this volume is organized chronologically and then by topic, covering studies of women and health in the colonial and revolutionary periods and the nineteenth century through the Civil War. 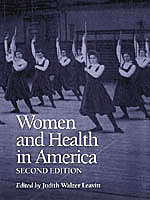 The remainder of the book concentrates on the late nineteenth and twentieth centuries and addresses such controversial issues as body image and physical fitness, sexuality, fertility, abortion and birth control, childbirth and motherhood, mental illness, women's health care providers (midwives, nurses, physicians), and health reform and public health. Judith Walzer Leavitt is Ruth Bleier Professor of History of Medicine, History of Science, and Women's Studies and the associate dean of faculty at the medical school, University of WisconsinMadison. Her many books include The Healthiest Cityand Sickness and Health in America, both also available from the University of Wisconsin Press, as well as Typhoid Mary and Brought to Bed: Childbearing in America 17501950. If you have trouble accessing any page in this web site, contact our Web manager. E-mail: webmaster@uwpress.wisc.edu or by phone at 608-263-0733.